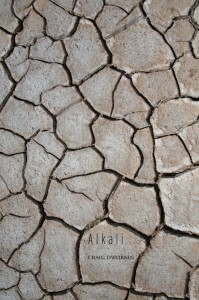 Alkali collects six works, including two desert pastorals describing the sonic and luminescent landscape surrounding the Great Salt Lake, two minimalist geometrical exercises exhausting the typographic limits of two particular oulippean constraints, a restaging of Clark Coolidge’s The Crystal Text, and a long lyric essay on the rhetoric of falling in French modernism. Working from the linguistic toward the literary (in Paul de Man’s sense of the terms), each of these poems attempts to construct a text of sonic density and impassioned argument from the entirely impersonal, inexpressive, chance motivations of the signifier. Together, they propose a mode of non-expressive poetics that seeks to evade the already clichéd styles and tones that have come to characterize the rhetoric of our present-day Conceptualism. Craig Dworkin is the author of five books of poetry and several chapbooks, including Dure (Cuneiform, 2004), Strand (Roof, 2005), Parse (Atelos, 2008), The Perverse Library (Information As Material, 2010), Motes (Roof, 2011), and Chapter XXIV (Red Butte Press, 2013). He has also published two scholarly monographs, Reading the Illegible (Northwestern UP, 2003) and No Medium (MIT, 2013), and edited five collections: Architectures of Poetry, with María Eugenia Díaz Sánchez (Rodopi, 2004); Language to Cover a Page: The Early Writing of Vito Acconci (MIT, 2006); The Consequence of Innovation: 21st-Century Poetics (Roof, 2008); The Sound of Poetry/ The Poetry of Sound, with Marjorie Perloff (Chicago, 2009); and Against Expression: An Anthology of Conceptual Writing, with Kenneth Goldsmith (Northwestern, 2011). He teaches literature and theory at the University of Utah and serves as Founding Senior Editor to Eclipse <eclipsearchive.org>.